'Writing about music is like dancing about architecture.' I thought that was attributed to Buckminster Fuller but it seems like it was Elvis Costello. While I think I understand what he meant, clearly I don't agree entirely, or I would not be spending my time on a blog like this. There is definitely a valuable discourse about music to be had, and music criticism is as valuable as criticism of any other art form (dance and architecture included.) But there is no proxy for hearing music; it is a singular experience that provokes a singular response, and all the scribblings in the world can only capture the faintest of its vapor trail. 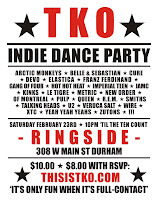 So the bar is called Ringside, and it seemed fitting to pick up on the boxing theme with an event title that is also a Le Tigre classic: TKO. You can see for yourself at www.thisistko.com. It's not going to be highbrow or elitist, and the playlist definitely will be more accessible than may of the tracks I've examined here. But it will be great fun, and that's a great reason to do it, all by itself.